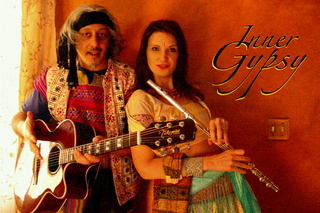 Classical forms from India take center stage with this hypnotic cut from INNER GYPSY""
The new album by Inner Gypsy may be the best example of philosophical gypsy pop meets husband/wife virtuoso musicianship since 1965... which is not to say that Sonny and Cher were proponents of virtuosic music or, for that matter, that Mario and Tiffany Sen have anything in common with them other than their charming cover version of "I Got You Babe." But just listen to the arrangements in "Mariah" and "Clear as a Bell," and you will hear a direct connection to the risks that pop music started to take in the mid sixties, and which all but disappeared with the demise of The Police some time in the early eighties. In those days, what we now term "Prog Rock" (read: Yes, King Crimson) had as much in common musically with Folk music (read Joni Mitchell, Leonard Cohen) as "Funk" had with "Psychedelic" inasmuch as they were all pop music. They cross pollenated and pioneered every possible combination of styles and sounds known to man. If we include such world music notables as Bob Marley, Salif Keita and even Ravi Shankar, we are now creating a gumbo of Katrina-sized proportions. 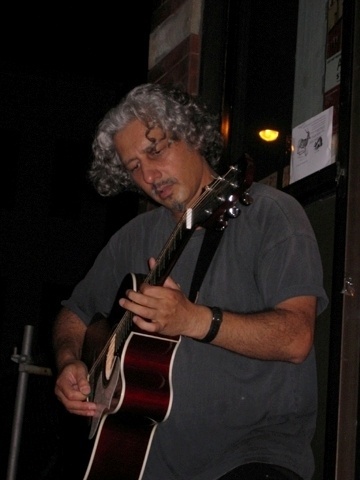 I asked Mario Sen (guitarist and vocalist with Inner Gypsy) if this is what he was trying to do: I know this will sound awfully cliché," he responded, "but we're just making music. We don't really separate the styles. Our fingers and our voices go where they please. It seems really artificial to us to draw lines between things like that. Like countries, for example. I'm not sure which one of the astronauts made this comment, but he looked down at the Earth, and he said he didn't see any borders like they have on maps. There were no lines drawn on the surface of the planet which separate us. We're all in this together." And certainly the lyrics of the title song, "Gypsychology," reflect that way of looking at life. But that is not the only mood represented on this artfully conceived and painstakingly executed album. "Only Seventeen," has an almost Kristofferson-like plaintive country feel to its lyrics, which bemoan those wasted early years. And "Trees," (a song supposedly sung by the trees themselves) comes at you with the joyous anger of one who does not resent the battles ahead. Meantime, the acoustic guitar and flute playing are simply splendid all the way through. After the fast synchronized runs in Gypsychology lending it that Latin feel, we go on a trip to most of the spicy and warm places this planet has to offer, (with a few diversions to the cold and lonely ones – "Hoboken" for example) and exit finally to the sweep of the Raga style meanderings in the grand finale track, "Mariah." You will love this album if you like to sit down and listen to music and let it take you where it will. If not just download the mp3 of "I Got You Babe," and dance to it while you cook tonight's meal. Thirty years from now it will seem as much of a classic as the original one does today. 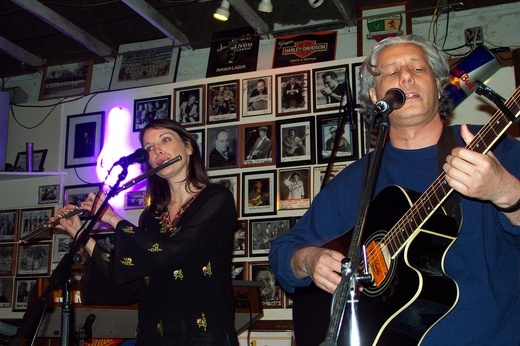 They sound really good with one another... the songs are easy to get into, with distinctive chorus and memorable hook..."
Inner Gypsy weaves together fiery flamenco-style riffs, beautiful love ballands, and virtuosic guitar and flute playing, inspired by Indian classical, Latin grooves and the best of American pop." Inner Gypsy's music is as free as gypsies worldwide." Mario's descriptive language in the cut "Hoboken" cover both the old city and its modern progeny, crowded bars, feelings of solitude for the outsider. He uses a Dylanesque tone in "Clear as a Bell" which touches on the basic unknowable essence of others." Mario's guitar technique makes a refreshing fusion of international styles available to a western pop audience." Tiffany's manner is very clear and strong. Mario's vocal parts are nostalgic and tearful." 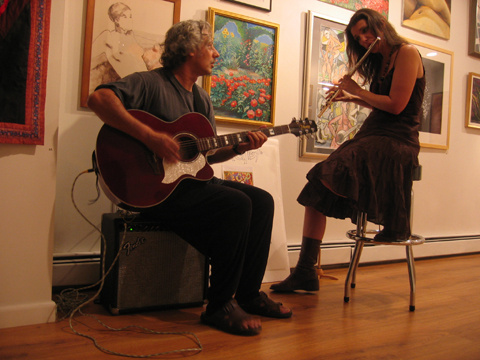 Tiffany Sen is a revelation on flute, never overplaying, always propelling her husband's exotic melodies forward." 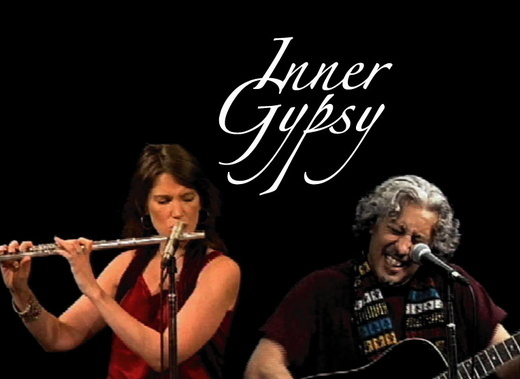 ... balladish songs grounded on melody, angelic sound of flute, virtuosic guitar and emotional singing..."
Inner Gypsy's abundant spirit and humanity shine brightly. 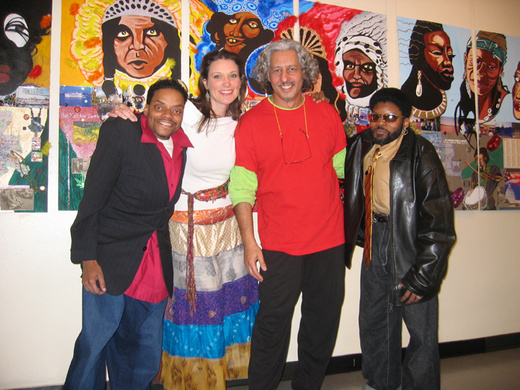 'Gypsychology' is their rallying cry, a vigorously performed, world-music-infused plea for human transformation. 'Hoboken' has a bucolic, atmospheric intro, with sensitive performances all around. We're most impressed by the act's Putamayo-esque instrumental sections." Enough space for 2 people to dance wildly.